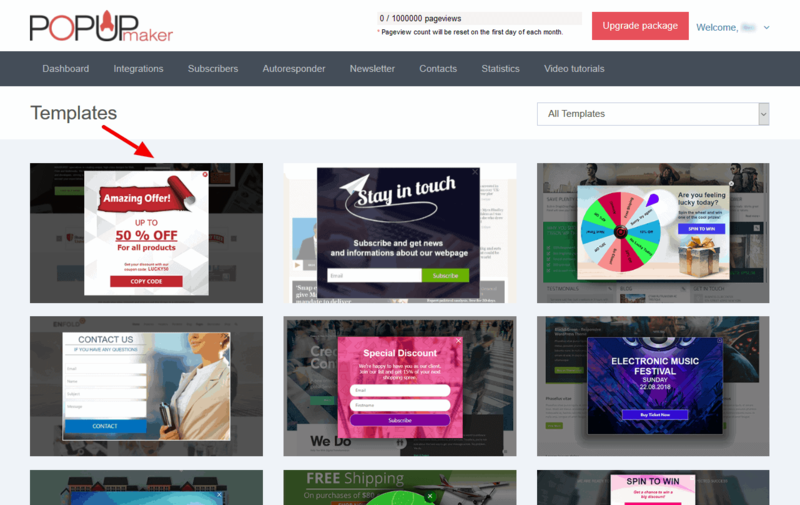 Popup Maker is the easiest to use popup creator tools known on the market. It provides all the essential tools that will help you build a perfectly converting popups. Bring more users to your service, convert more subscribers and increase your sales with the help of Popup Maker. 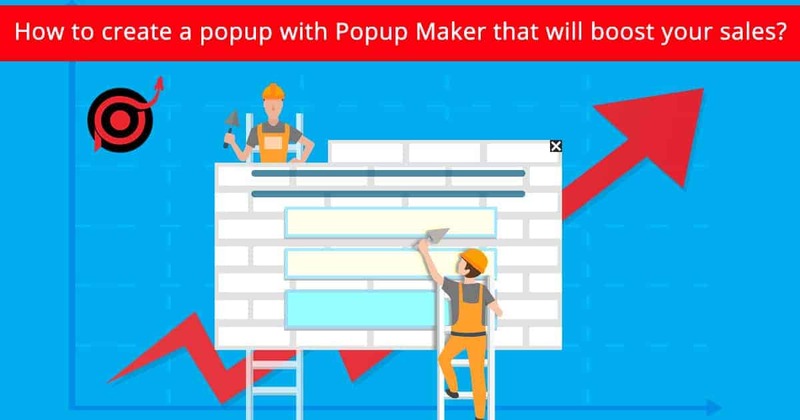 Popup Maker provides you with 2 ways of creating popups – From Scratch and From Template. More than 40 beautiful templates are offered for your choice. Each of the beautiful popup template is easily customizable, so you can set it up per your needs. You are free to make any changes you need to get the exactly matching look on your site. The templates are all in all packages to provide you with easy setup and high conversion rates, even for the non techie users. How to create the popup? As soon as you select the template that suits your needs the best, you can start editing it. 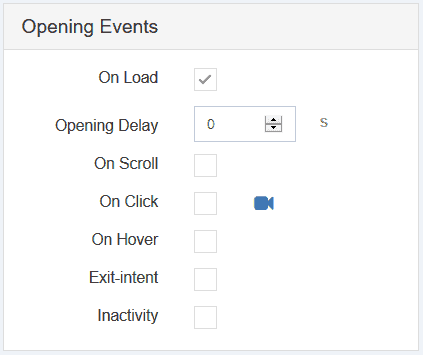 Set up the General settings of your popup, including its dismissing options and showing frequency. All the customization options are available for editing the popup, including the design options, display rules, opening events, etc..
You can edit each element inside the template, simply clicking inside the editor. The editing options for each element will appear on the right side of your page. 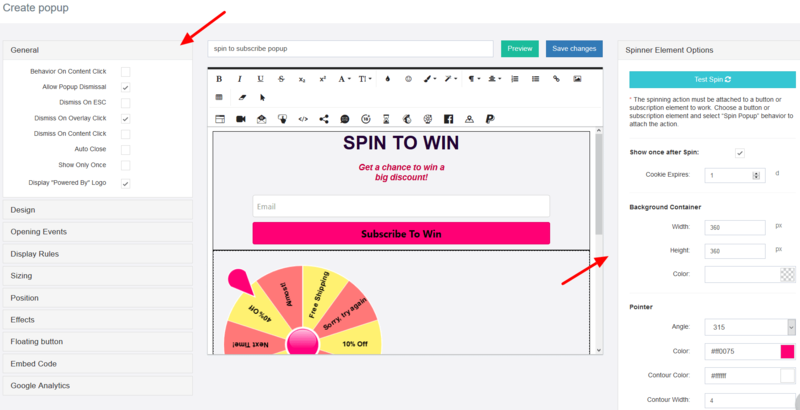 The example below is shown with the Spinner subscription popup. This is one of the most successful templates Popup Maker offers, it has brought high conversion rates to many users of ours. The popup appears with a spinner wheel inside and the users get a discount from the spinner, as soon as they hit the “Subscribe” button. This way, you collect more subscribers to your list, and get more sales, due to the discounts they win via Spinner. Popup Maker offers all the necessary triggering events for popup opening on a website. Exit Intent is one of the most preferred events among users these days. This is the most attractive means to catch a user’s attention. Just when they are about to leave your site without completing your desired actions. Popup Maker Mobile Exit Intent option is one of the latest innovations in the service. Now, the users can show an exit intent popup on mobile devices as well. What could be more enticing? The popup on mobile devices will appear when the users click on the back button on mobile screen or double tap to switch the browser tabs. Here’s another great article for mobile exit intent popup setup: How to show an Exit Intent Popup on Mobile devices? Previous Post:Boost More Sales with Mobile Exit Intent popup! Next Post:Popup Maker Drupal Module Released!